Law offices can be a chaotic work environment, and the more you try to organize, the more cluttered it seems to get. Most law firms deal with significant challenges regarding handling an ever-increasing pile of important documents, files which can be vital in many respects, from providing accurate billing information to court documents. While it’s crucial that these documents are organized, it can often feel like a chore, taking up much of the work week. Even when documents are placed within correct files, finding them on a later date can be just as time-consuming as when they were first saved. That’s why it’s a smart strategy for law firms to look into adopting legal document management software. Some law firms might show reluctance to adopting an electronic solution to document management. After all, legal documents can contain sensitive information, and manually filing physical documents has simply been the way it’s done for years. Modern legal document management software solutions, however, are simply too advantageous to pass up. They lower the overall cost of handling documents while also providing law firms with increased revenue. This is all tied to increasing a law office’s overall efficiency. Let’s start by looking at how using legal document management software can save office workers time. 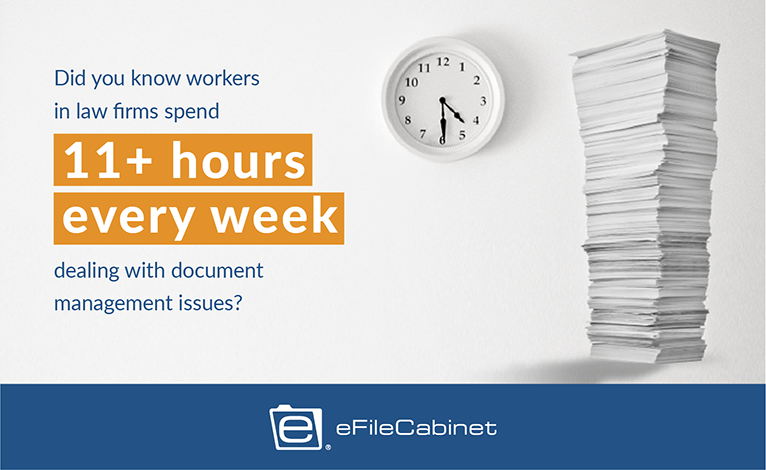 One recent study found legal professionals end up spending up to 11 hours every single week dealing with document-related challenges in the traditional law office filing system. Take a moment and think about how much time is needed to properly record and store your documents in the right place. Then consider how much time it takes to find that one document you need for the case you’re working on. Even under the most efficient physical file systems, finding that one morsel of information can take a very long time, sometimes adding up to hours. And that’s only if the file is in the right place to begin with. A document that was misfiled can take even longer — if it’s found at all. Legal document management software saves significant time on filing your important documents. This type of management software automatically files these documents in their proper places, complete with all necessary and helpful tags and metadata. Many of these redundant processes, including naming the files, become automated, leaving everyone in the office with more hours to work on other tasks. Finding the right documents becomes a breeze as well. Through advanced and easy-to-use search features, you won’t have to spend inordinate amounts of time looking for a vital paper. A simple search will reveal where the document is along with all its contents. You have a lot of information at your disposal, and legal document management software now places it at your fingertips with minimal hassle. Some of the benefits to saving time can be felt on the revenue side of things. If you’re not spending long hours filing and searching for documents, think of how many more cases you could take on. More cases means more clients, and more clients means more revenue. Not only does legal document management allow you to take on more cases, but it can help you be more efficient with the cases you have. The benefits of this can’t be understated. Legal document management essentially gets rid of the busy work that so many law firms experience. That allows everyone within the firm to focus on their cases, thereby improving the quality of legal advice. In a sense, legal document management software streamlines your current work processes. The result is a law firm functioning like a well-oiled machine. By utilizing legal document management, your firm can gain other benefits as well. For one, it helps to eliminate human error. Even the best legal professionals can make mistakes, and even the smallest mistakes can end up hurting your law firm. With this type of software, the chances for human error decrease significantly. Legal records document management software also keeps track of who works on which document and what they did. By recording the work history of a document, you’ll have added knowledge over any changes that are made, which is especially important when working with judgments, affidavits, depositions, and more. Legal document management is also secure. While some law firms may be a bit skittish about using software with these types of documents, the software protects this sensitive data, even when you share it. Everything is secure and encrypted, meaning you won’t have to worry about satisfying the many security requirements out there. Law firms already know how to work hard, so it’s time to learn how to work smarter. Legal file management software gives law offices the capabilities to become more efficient, helping them save time, increase revenue, and cut down on possible mistakes. The modern law firm must look into document management in order to remain competitive today and well into the future. For more information on how legal document management can improve your ROI, download our ebook: Streamline Your Workflow and Improve Your Firm’s Efficiency.